Some of the best things in tech aren't necessarily the most straightforward. Indeed, some of the best tech innovations are some of the most off-the-wall. Here we look at eight new but weird and wonderful technologies that we could see in popular use in the near future. MessageMind is a powerful business tool for determining whether email messages in a company are actually meeting business objectives. And we could soon see it elsewhere, too. So, you can see all messages related to a project in a bubble diagram that shows who is communicating effectively and who is slowing down the project. You can easily prioritise emails using a real-time analytics engine. The platform works with Outlook and other collaboration systems such as Microsoft SharePoint using algorithms that extract keywords from communication -- based on which users are accessing messages and their prioritisation. Every image has a signature - or pattern - that can be detected. Guardian Technologies, using their new PinPoint software, can be used to find the signature of an explosive agent at airport security checkpoints, or to find traces of a cancerous cell in a mammogram. The technology scans image sin real-time and looks for patterns, then alerts the operator to a potential threat or danger. The engine works on both still images and video, and is being deployed in South Africa to detect traces of TB. Every great song reminds you of another great song, or so goes the theory. With Uplaya.com, you can add some statistical analysis to your grunge-metal songwriting process. The site lets you analyse a song to see if it will be a hit, based on metrics that show a connection between current hits songs, such as a certain bass line or an upbeat tempo. The concept was actually discussed on a current episode of the show Numb3rs -- and it works. Uplaya can even show if a song will stay a hit longer. Nanotubes are incredibly strong, but manufacturing them into a usable material is difficult -- normally, they lose their strength. Nanocomp has developed a way to build a nanotube material that can stop a 9mm bullet, yet is feather-light and only a few millimetres thick. As an added bonus, the material also forms an electromagnetic shield to obfuscate an cell phone or other radio device. A new audio technology uses two high frequency wavelengths at low power to pinpoint an audio signal at a precise location. When the two sound waves meet, they produce the sound. The technology could be used for projecting music to a specific spot in a room. When you walk within range of the signal, the audio sounds like a whisper and when you walk out of range you can't hear the music stream at all. Home insulation could become a quant relic of the current age. 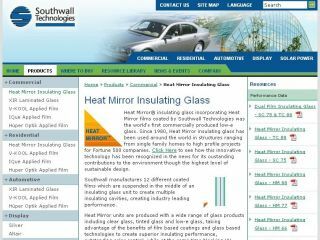 Heat Mirror technology, developed by Southwall Technologies, puts the insulation in a pane of glass. It is essentially an insulated coating on glass that uses three see-through panes. The glass is suspended in between the outer glass and works just as effectively as R-20 household insulation. The result is that the Heat Mirror material could be used for office buildings and homes to block UV rays and provide better insulation.